Sunday mornings are for lazying around and for delicious breakfasts, of course. And on Sundays The Gentleman gets his served in bed. One thing where the French really are on to something is their delectable contribution to the world of breakfast dishes: French toast. 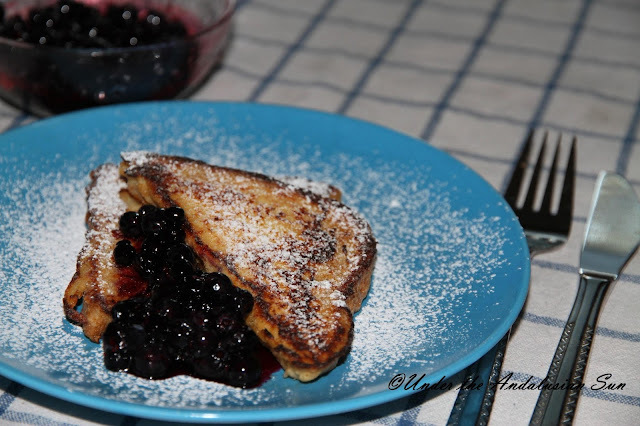 Egg-soaked bread fried in butter, served with berries and a dusting of icing sugar. That is also my niece's and nephew's favourite way to start the day. If there's one thing these 6- and 9-year-olds have learnt it is this: proper French toast is definitely not cooked in a whiff of health-conscious low-fat cooking spray substitute. Answer to "what do we need now?" comes from these chef apprentices immediately: BUTTER! This is a delicious way to recycle stale bread otherwise going to waste (I suppose that's how the treat got its original name pain perdu, wasted bread from?) so we often use regular toast for this. Whisk the eggs and mix with milk. Add the coconut flakes or coconut meal along with sugar, vanilla sugar and cardamom (in case you're using coconut meal, you might want to add a bit more sugar). Slice the toasts diagonally and let them soak thoroughly in the egg-mixture. Heat the butter in a pan and fry on both sides until crisp and golden brown on the outside. Dust with icing sugar and serve with berries.